The Regressed Experience: Is it Real or Imagined? A very common question asked by patients upon coming out of a regression therapy session is whether the life stories that emerged under trance and which were experienced by them in full emotion, were in fact real. Perhaps the question could be split up into its component questions so that clearer answers could be obtained: Why does the regressed experience appear so real? How is guided imagery related to imagination? How does imagination come about? Is imagination a form of fraudulence? Mental imagery is being used all the time in regression work. This is because it is an effective window to the patient’s inner world and provides a way for him to view his own ideas, feelings, and interpretations of the world around him. The guided imagery used in regression is often rich, symbolic and metaphoric, and as such it functions as a highly personal language. There is nothing new with the guided imagery technique. Man has long sought contact with the deeper realms of his psyche through the use of mental imagery. The vision quest of some native South American tribes is one such example. In this practice, a person would spend a few days and nights in secluded nature, and practices fasting and flagellation in isolation until he obtains a vision of his totem animal. During this time his communion with the fundamental forces of creation and the spiritual energies of self-identity allows him to receive profound insights into himself. These insights are often directly related to his purpose of life. Likewise, the practice of induced dreams is another form of evoking the symbolic potential of the psyche. This custom was commonly utilized in ancient Greece and Egypt, Indian and China. The practice forms an interesting link with the contemporary use of guided imagery in that the person provoking a dream to seek guidance for an important decision or healing of an illness was trying to establish contact with a divine or archetypal healing image that could provide this help. In much the same way, the modern guided imagery technique evokes numerous symbols through which the patient receives inner guidance and healing experiences. 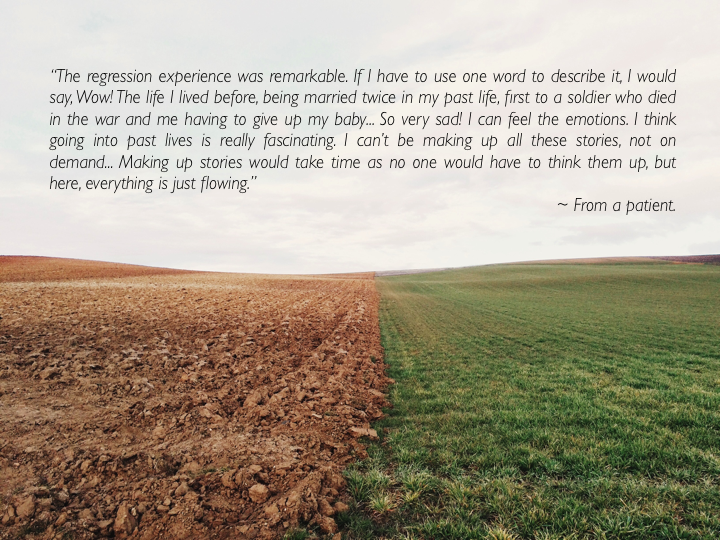 In regression therapy, the guiding of the patient through a visualisation process helps him to create images and stories that amplify the positive aspects of his mind-body connection. This facilities the process of uncovering the inner truth from himself. Imagery per se does not require that the patient is able to visualize objects, people or energy beings. He may perceive things in his mind’s eye, but he can also hear with his inner ear, and feel, taste, and experience other sensations with his imagination. Some people imagine in vivid, visual images with colour, sound, smell, and sensation, while others may experience sounds or thoughts in their mind without pictures. Some will be more aware of senses or feelings that guide them and let them know when they are close to something meaningful. It doesn’t really matter how the patient imagines. Once he learns how to recognize and work with his own mental imagery, the latter becomes a vehicle to deeper understanding and insights. For three thousand years, poets have been enchanted, moved and perplexed by the power of their own imagination. Imagination is specifically a human gift and noticeably absent in animals. To imagine is the characteristic act, not of the poet’s mind or the scientist’s, but of the mind of man. It is a common misconception that imagination is a form of illusion and self-deception. Many of us draw a sharp contrast between the world of imagination and the world of reality. We often use a phrase like “figments of imagination” as if the product of the imaginative process is mere fantasy. Medical undergraduates under clinical training encounter the term commonly while on their Psychiatry rotation, and as a result, tend to assume that imagination is a psychopathological and non-respectable process. Even to the lay person, the concept of imagination has an air of the unscientific about it. However, the world of imagination does not take us away from the world of reality. Imagination is our capacity to form mental images, analogies, objects or events in the absence of stimulation of brain receptors. The most important images are abstract symbols. Imagination may also be viewed as the ability to call forth mental pictures of absent individuals, objects or situations at will. The process involves the reorganisation of data derived from past memory or experiences into a new mental pattern. This pattern differs from the perceived reality of the past. The images play out for us events which are not present to our senses, and thereby guard the past and create the future – a future which does not exist and many never come to exist in that form. The future may be something wishful, but when applied in therapy, it often translates into a powerful problem-solving process. Is Imagination a Way of Self-Falsification? The answer is categorically no. Imagination is a different process from hallucination. While both are creations in the absence of real-world stimuli, one can, in the case of imagination, discern the creation from the real world. In the case of hallucination, the discernment is lacking. Furthermore, hallucinations are accompanied by anxiety, paranoia, fear or some strong emotion. Medically speaking, imagination is a physiological process whereas hallucination is pathological. To sum up, imagination is the ability to make images and to move them about inside one’s head in new arrangements. This is the faculty which is specifically human, and is the common root from which science and literature both grow and flourish together. In the context of regression therapy, the patient’s experience does have a strong element of imagination, but it doesn’t matter if the imagery is a true representation of reality or not. From the standpoint of the therapist, what matter is the healing effect that flows from it. Martha Crampton, Guided Imagery: A Psychosynthesis Approach. Quebec Center for Psychosynthesis Inc. Montreal, 1974.